For us, being an international culinary presence involves more than learning about global flavors. We are a multicultural company with more than 50 nationalities from around the world represented inside our plants and in our kitchens. With locations in France, Thailand, and the U.S., our chefs are schooled authentically in diverse regional cuisines and have access to fresh, local ingredients. Our employees keep Cuisine Solutions on the cutting edge of food innovation with their expertise. Each location has a specialty and shares its food with the community. Like the sous vide technique itself, our company was founded in France! Though Cuisine Solutions was established in 1987, our plant in Louviers first opened in 1989. Many dishes with French ingredients are produced at the Louviers plant today, including burgers made from Burgundy-sourced Charolais beef, beurre blanc made with Normandy butter, wild boar and guinea fowl dishes, and our beef cheeks in red wine sauce. The Alexandria location was founded in 1989 and served as our U.S. headquarters until 2014. Today, Alexandria makes many of Cuisine Solutions’ enrobed specialities, which include tortellini, mushroom risotto, white wine risotto, and mac and cheese. Sauces like our Asian-style BBQ sauce and fire-roasted pepper sauce, small-batch sous vide proteins, and our Amazon cod are all cooked to perfection in Alexandria, too. Our corporate headquarters since 2014, Sterling has a kitchen that’s always unveiling new things—like our patent-pending sliced products, including sliced beef, grilled chicken, and roasted turkey. This location specializes in cooking Sous Vide Egg Bites, 72-hour short rib, octopus dishes, organic five-grain oatmeal, and our Berkshire pork belly. The Sterling location is also where our school lunch concept Café + Teria was born. The program brings healthful, customizable lunches with sous vide proteins to high school students in Arlington County, Virginia. 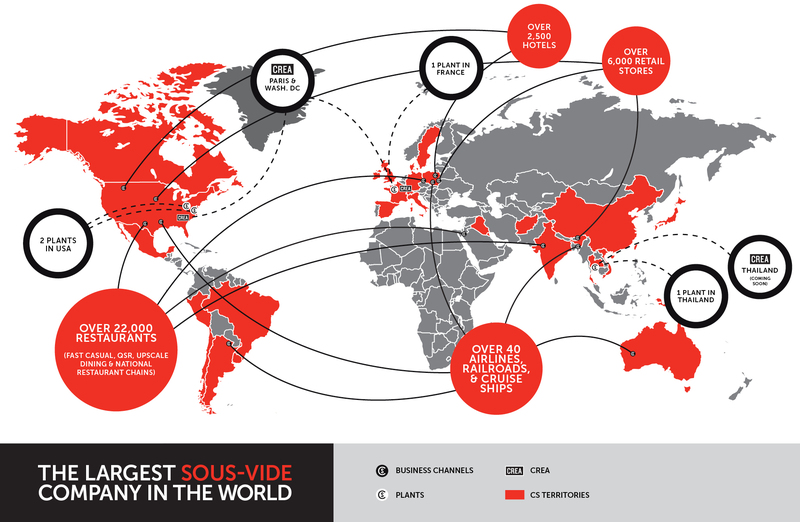 Cuisine Solutions opened its Thailand location in 2017 to meet the growing demand for sous vide in the region and to fulfill orders from our long-time customer base in Asia even faster. The Thailand location makes our coconut chia oatmeal with locally sourced, fresh coconut milk, which gives the product its amazing flavor. Crab cakes and oilfish are also prepared at our Thailand plant. It shares our sous vide cuisine with Thai diners via a chain of local French-style bistros called Love Me Tender.